If you need a minimalist icon set, this is the perfect choice. 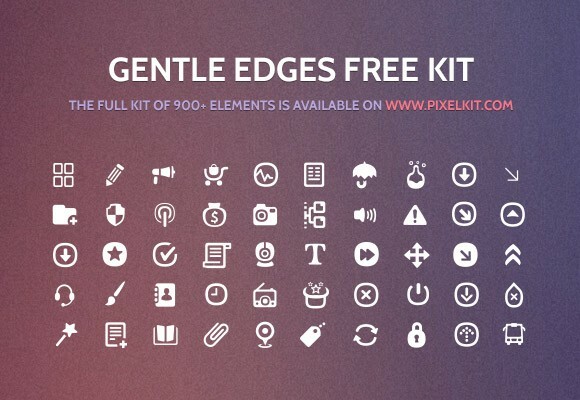 Gentle Edges is the minimalist icon set developed by PixelKit. All of the icons are nice and simple, and that means they should work well with many different types of websites. They are vector graphics, and that means you can resize all of the icons until you get the size you need for your site and the icons will always look nice and sharp. This kit, sponsored by Freebiesbug, features a single PSD file with 50 icons in different categories. Some of the categories include Multimedia & Hardware, Commerce & Finance, Ratings, Places, and Artwork. The icons are easy to use and they look great! Rather than searching Google or paying a designer for their work, it might be a better option to go with PixelKit. It’s a robust library of high quality UI kits, as well as other design resources for your needs. Why bother with this resource? There are quite a few reasons, but the one that’s most important to understand is that the site specializes fully in creating UI kits. They offer buttons, sliders, boxes, visual controls, menu elements, app screens and more. Think of it like taking your car to a specialist mechanic. If you just need an oil change, almost any shop will do, but if you need expert work done, you’re going to take your car to someone who knows their stuff – an expert who specializes. PixelKit creates outstanding Web UI Kits for designers and web developers. The amazing collection of icons, characters, web elements and graphic resources are ready to rock your next design. Posted on September 3, 2013 February 5, 2014 in Free PSD, Icons and tagged icons, exclusive, featured. This post has been viewed 19563 times.